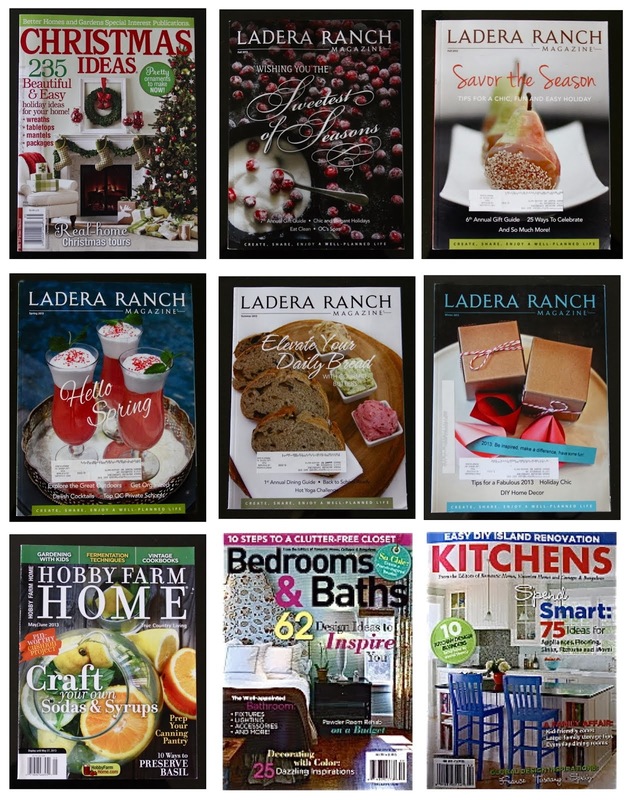 Featured in today's post are floors provided to me by Select Surfaces Laminate. With every project I finish on the weekends at The Blog Cabin it get's harder and harder to leave (If you're wondering what The Blog Cabin Project is, click here). 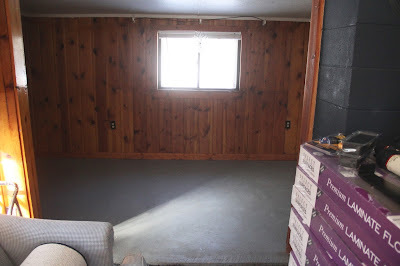 I mentioned I'd be starting this cabin makeover in the Living Room and Bedroom (which are connected). I did this so I'd have two comfortable, pulled together rooms to enjoy and relax in while I'm there working on the rest of the cabin. Today, I'd like to share some of the progress I've made so far. Thanks to Select Surfaces Laminate, the makeover of this space began with beautiful new floors. More details to come on the floors later this week, including a behind the scenes look at the installation process. I'll also be sharing why I chose this particular product and how I came to a decision on the color. Outside of the flooring, the biggest design element in this area is the knotty pine paneling. 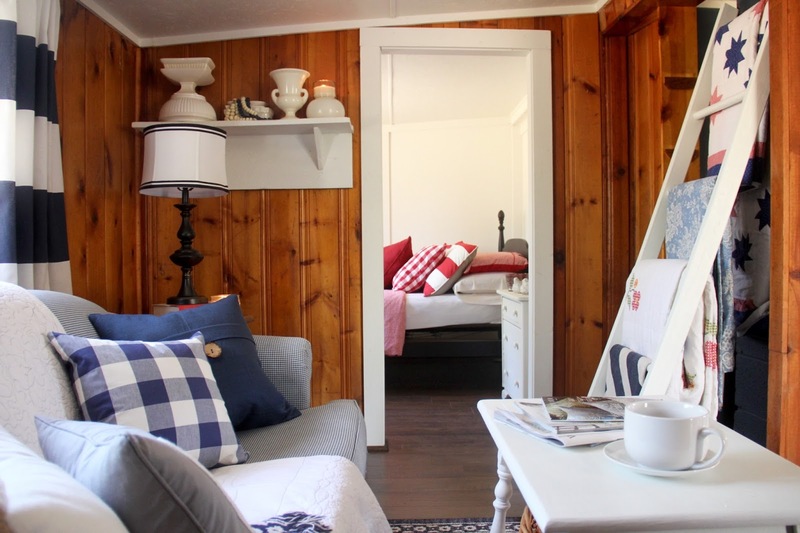 The paneling is original to the cabin and gives it a ton of warmth and character. When my Mom gave me permission to do this makeover, her only request was that I didn't paint the paneling. I totally agreed with her that it'd be a crime in this instance. 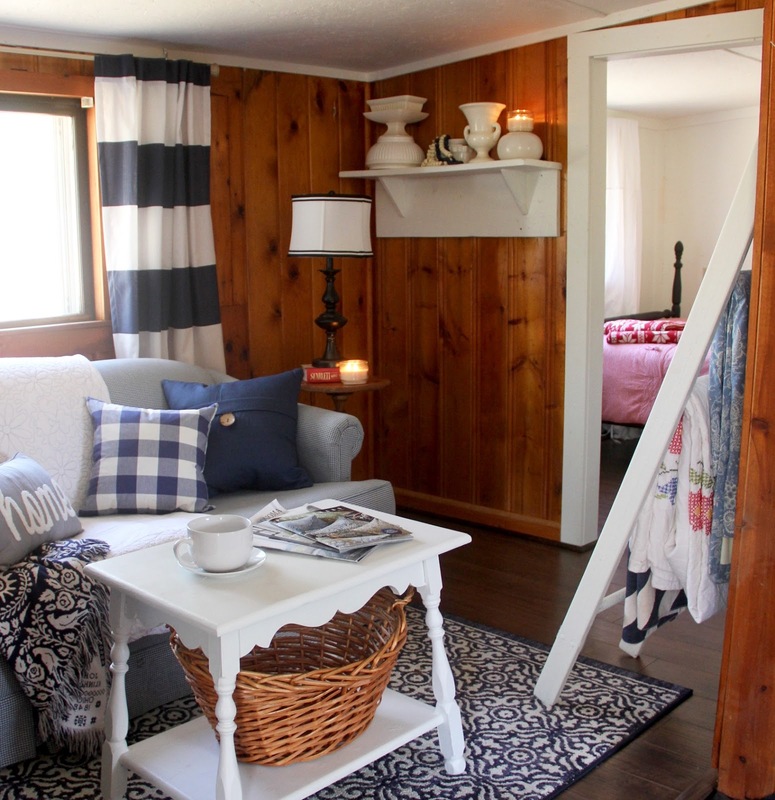 After all, my goal in this makeover is to preserve the original cabin/cottage charm of the place. Our family has a lot of memories here going back a few generations so I didn't want to change the look too much. I embraced the paneling by choosing a flooring color that complements it. I also incorporated a ton of cool, light colored accents to contrast with the rich, warm wood tones. 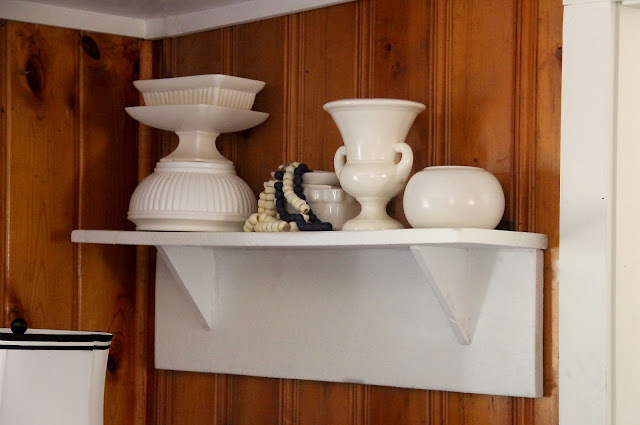 Another one of my goals was to keep this makeover budget friendly by re-using items that were already in the cottage. Giving the existing furniture a quick coat of white paint unified the mismatched collection of items and also provided crisp contrast to the paneling and floors. 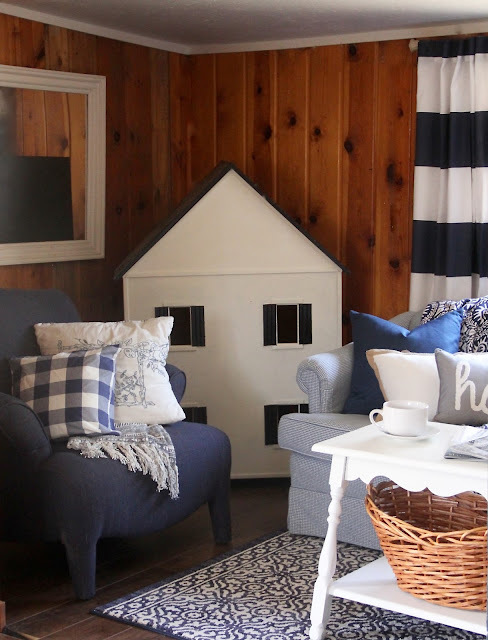 In addition to looking really cute, re-using the furniture that has been in the cabin for years invokes feelings of nostalgia for my family and guests. To take this feeling to the next level, I brought in some furniture that has special meaning to my family. Like this doll house that my dad built for my little sister when she was a baby. I'm using it for storage, the backside is open and is a perfect spot for storage baskets. I hit up my Mom's vintage decor stash to accessorize the space. I love how this white on white vignette brightens up this otherwise dark corner. I wanted to keep the look in this room very simple for now and continue to build on it with time. I'm hoping to host some "Pinterest Project Weekends" in the near future to create some custom art to personalize the cabin even more. This sofa is a sweet piece that could probably stand to be replaced soon as it has seen quite a few years of use. 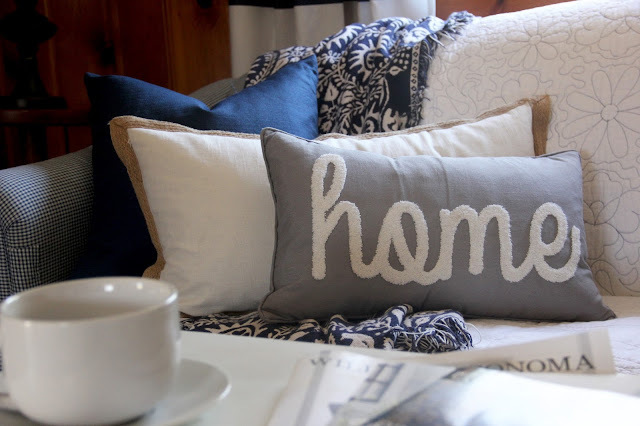 For now, I've piled it high with quilts and pillows from HomeGoods and Etsy to cover the areas of wear. It seems to beckon visitors to run and jump on it, which in my opinion is a good reaction. Maybe it will stay a little while longer. 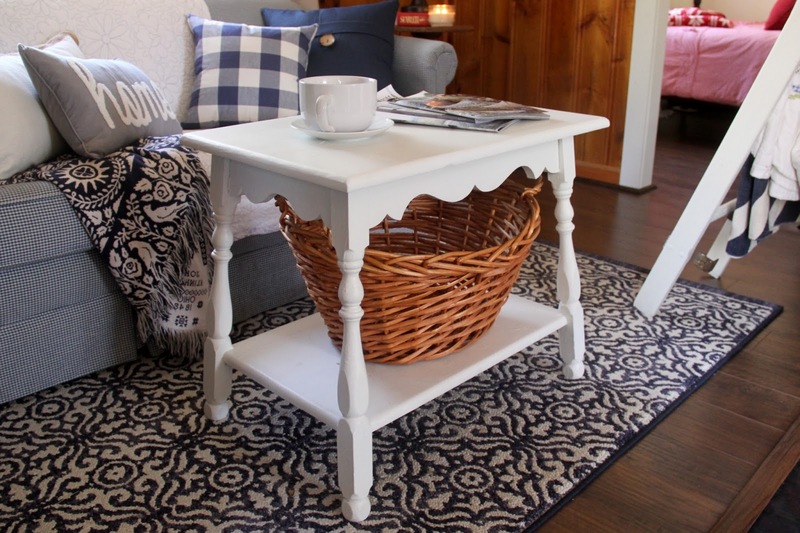 The "coffee table" was previously a TV stand. After a quick coat of paint and the addition of a storage basket underneath, I decided it made a great coffee table. It's a little taller than a coffee table really "should" be, but it's perfect for me. This is where I sit to blog when I'm at the cabin and having my laptop up a little higher is nice. This cabin has a few awkward little areas. This is one of them. There used to be a wood burning stove in this corner, which is no longer in place. This has left an opening in the wall that could be a major project to fix or design challenge to work around if I let it be. Instead, I decided to embrace it and make it an interesting, useful storage feature. I found an old ladder, painted it white and filled with folded quilts. Leaned up against wall in the niche it disguises the old chimney. It also invites you to come in, grab a quilt and snuggle up for the weekend. If you've ever visited Michigan, you know it gets dark pretty early during the winter months. For added light, I've placed table lamps on each end of the sofa along with a small floor lamp in the corner. 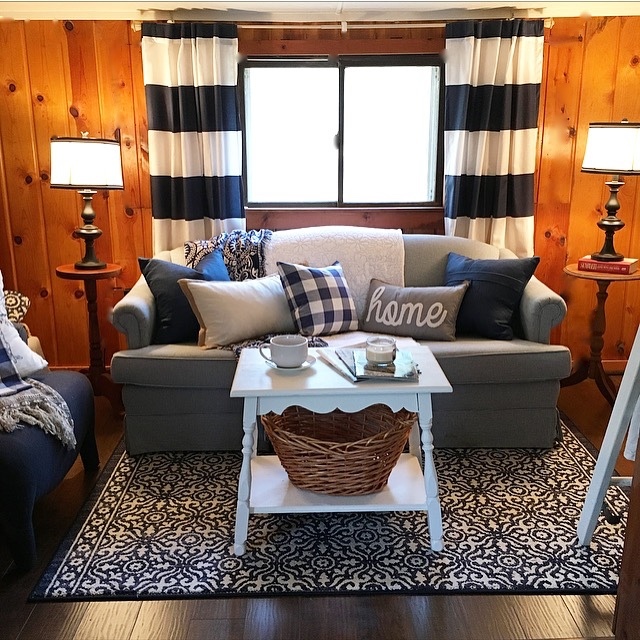 At night these lamps illuminate the knotty pine paneling creating a cozy, romantic atmosphere that's pretty close to the feeling of a giant hug. With all of these traditional design elements, I wanted to introduce a little drama. So, I brought in some bold patterns, and high contrast fabrics. I found the navy and white striped drapes at HomeGoods for a steal. 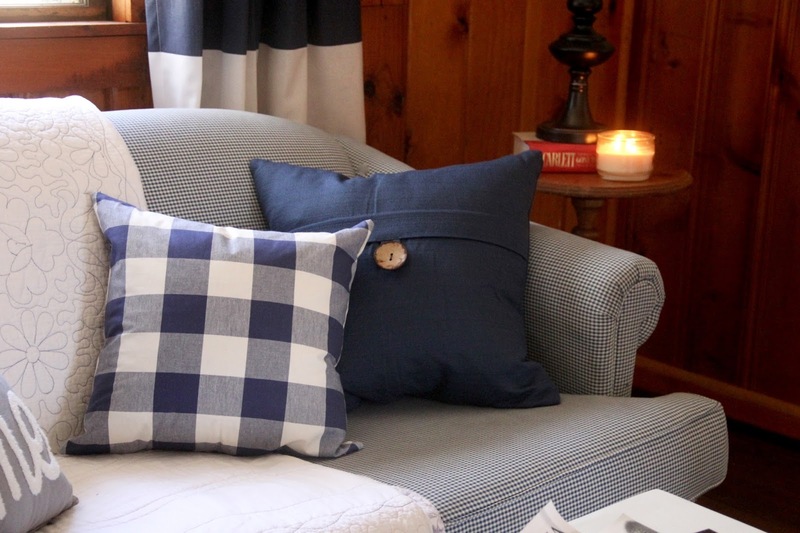 Every cabin needs a dose of buffalo check, so I hit up Etsy for large-scale checkered pillows. Staying true to my goal of keeping this project budget friendly, I purchased the navy area rug at Walmart. I still can't believe I found it there. It's made by Mohawk and is one of the softest rugs I've ever owned. 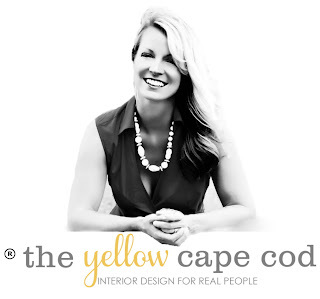 I can't wait to share more details about how this room came together. 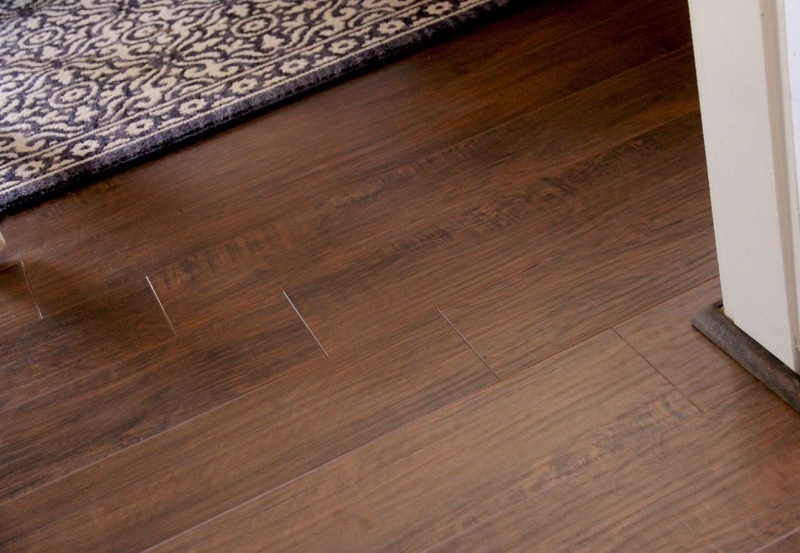 Stayed tuned for a post later this week dedicated to these gorgeous laminate floors! In addition to that, I'll be back on Thursday with a very special post with sneak peeks into the Dining Room at The Blog Cabin. 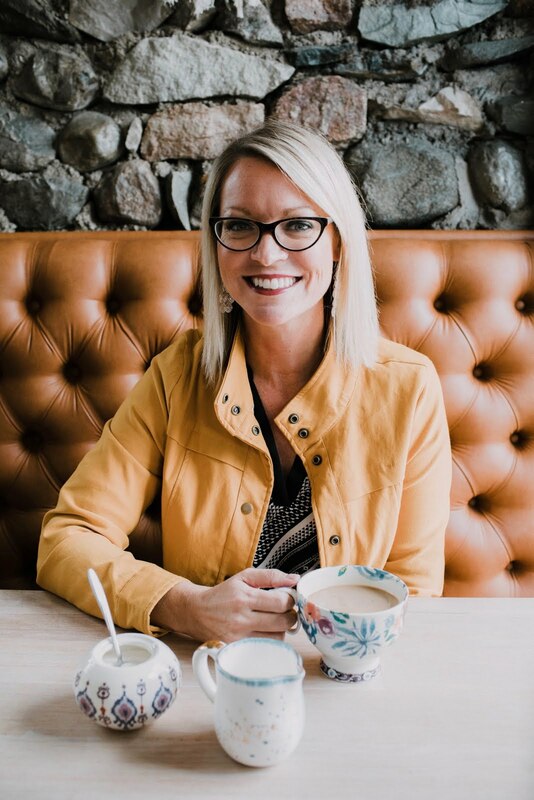 If you want to follow along on this adventure with me from the beginning to the end, you can do so by clicking on the links below. Thanks for stopping by! *This post is sponsored by Select Surfaces. 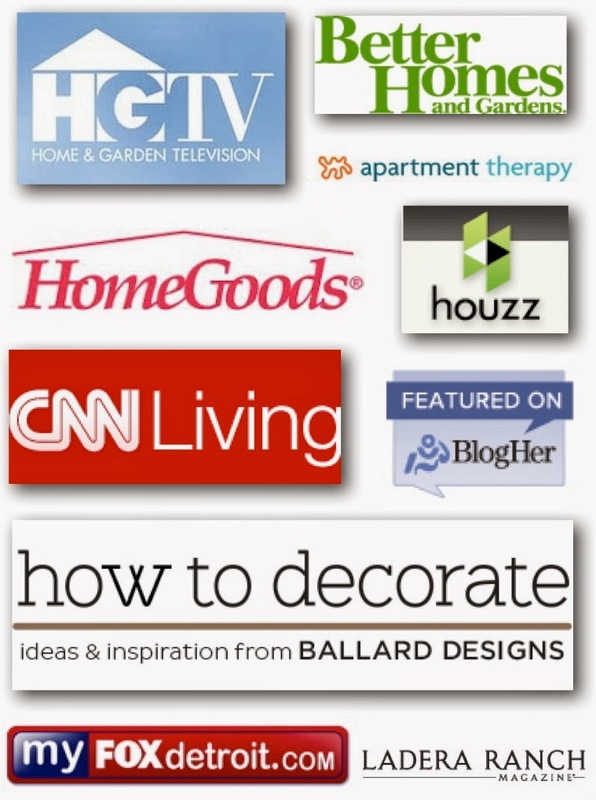 I received laminate floors from Select Surfaces in order to facilitate this post. All opinions are completely honest and 100% my own. Makes me long for a cabin to decorate!!! ...and I love your old couch and it's fabric pattern!! ! 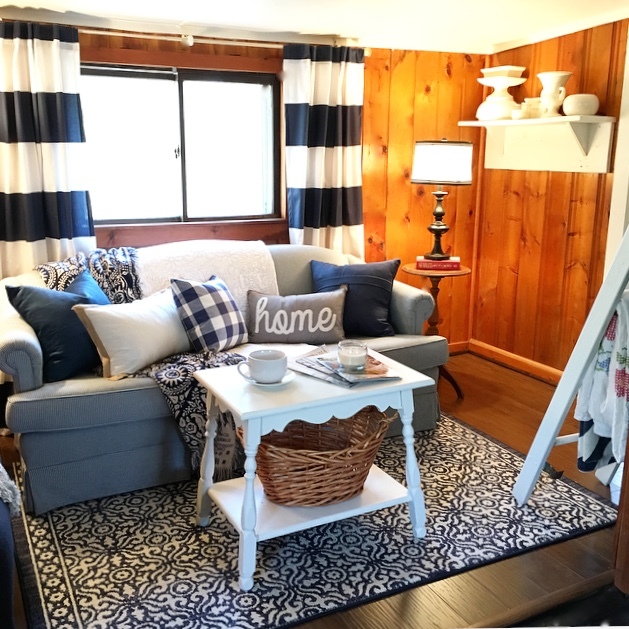 A most wonderful makeover!....Love the patterns that you have chosen...the room is so very beautiful and cozy with so many pretty details! 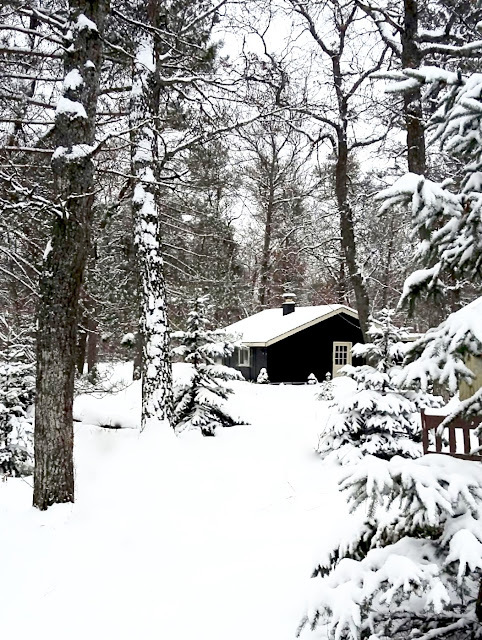 Everything is lovely and the cabin looks as though it is set in a fairy tale. What a wonderful retreat!